Dr. Wallace is a 2003 graduate of the University of Illinois at Champaign-Urbana. She is from the tiny town of Stuttgart, Arkansas and attended the University of Arkansas at Fayetteville for her undergraduate curriculum. She opened Gulley Park Pets Clinic in March of 2009. 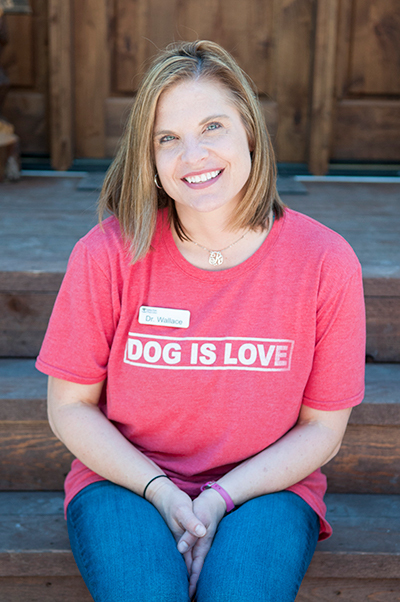 She has worked at a number of private practices in Northwest Arkansas in her years as a relief veterinarian and is thrilled to now have a place of her own to care for her fabulous friends and clientele. Dr. Wallace is the proud parent of four wild kiddos–Noah, Wyatt, Caroline, and Wesley Ann. She is our favorite Northwest Arkansas Veterinarian!